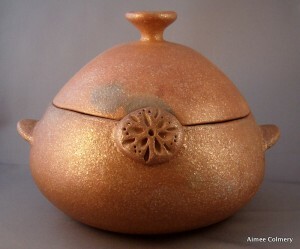 Micaceous cooking pots are created using the traditional coil and scrape method of hand building. The walls are built up and joined at the top. The pot is blown into like a balloon before sealing it closed. Knobs, handles and medallions are added. Then the pot is then sliced to create the lid and base cooking pot. After the pot thoroughly dries, the pot is then moistened and scraped. Then it is sanded with coarse and fine sand paper. Finally each pot is polished into a glittery sheen by adding a “slip,” and then “polishing until my arms fall off” with polishing stones and a soft cloth. A kiln load is fired in an electric kiln to about 1500 degrees F, making the cooking pot ready for the kitchen. A ‘firecloud’ from an additional wood firing blessed this pot. During my first woodfiring at my teacher’s house (Filipe Ortega), we left the fire to walk down to his house to feast, and the lid to this casserole slid off the fire. My guess is that the firecloud flowing out of the medallion resulted from a piece of burning ponderosa bark that probably cushioned the lid’s roll way from the fire. This is my favorite cooking pot. My friend, Tanya Story, an amazing professional chef and sculptural artist, absconded with this pot a while back when I took a dish to a potluck at her place. I love it that she wanted it and kept it! Pricing: $50 per quart plus shipping.